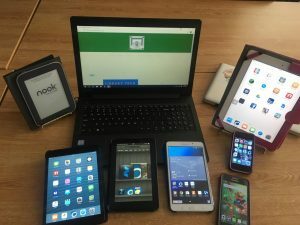 Need help using your eReader, tablet, laptop, or smartphone? We can help! Call us at 607-587-9290 and make an appointment. How to put FREE library apps on them. All of these materials, like the apps themselves, are FREE! At the Box of Books, you can also Borrow Gadgets (adults only): we have a Kindle Fire, iPad, iPad Mini, Nook SimpleTouch, and Samsung Galaxy. Call or stop by for more information. Want to learn about computers and programs online? GCFLearn Free offers free video tutorials on over 180 topics, with more than 800 videos and 55 + interactives and games. Go to www.gcflearnfree.org to get started!